Karma, a young, healthy, sweet Husky dog, was taken by Orange County Animal Care on May 25th and has received an order by a Judge to be executed. Her owners were arrested over a domestic dispute and taken into custody. Karma was impounded. Family members immediately started calling OC Animal Care to try to get her released to them. One of the officers stated she could not be released because someone called in and described the dog as looking like a wolf, and if she is part wolf she would be destroyed. 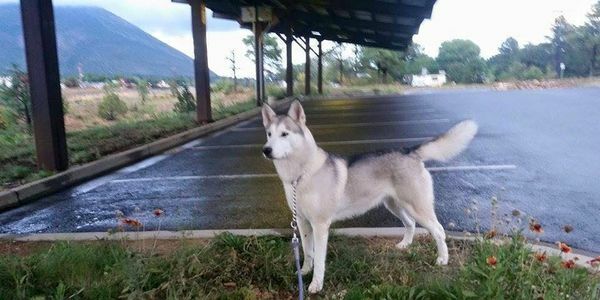 Please sign this petition to tell OC Animal Care not to kill Karma the husky! Orange County Animal Care had a DNA test performed. UC Davis confirms that ANY dog of ANY mix or purebred will have up to a .09 Wolf genetic makeup and Karma’s is .15 – very low! Additionally, UCD claims that the test done is NOT ‘court certified’ that OCAC did not request that kind of test that could be used in a court proceeding. The director of the UC Davis lab that did the test for Karma, Cecilia Penedo, confirms that she was the person who did the test. She said that Karma showed extremely low wolf content. She also confirmed that a dog such as a Husky or Shepherd could get the same results as Karma; that most dogs would test lower but just barely. She said that these test results could happen to a dog that is not a wolf dog. NOTE: Wolf dogs are not illegal in Southern California, so Karma should have never been held without release for this reason. Since May 25, 2015, Karma has been in isolation with no access to run, take a walk, stretch her legs, or breathe in fresh air. She’s allowed no visits with her owners or family members. Karma is a wonderful and friendly dog. She was raised in a home with 4 kids and other dogs, is friendly and has never shown any indication that there is any reason to question her loyalty to humans. Karma is also a Licensed Service Dog for her owner Josh Ogle. The owners have appealed this decision but did not have an attorney and the court decided to execute Karma based on many erroneous facts presented by Orange County Animal Care. They now have an attorney who is helping them and need a stay in Karma's execution to have the correct facts presented to the court. We are asking that Karma be released to the owners or a rescue until this can be heard in court. Please help us STOP Orange County Animal Care from executing a family pet and a dog that has done nothing to deserve this! We are sending letters, making calls, sending social messages to all government entities that can help us STOP KARMA'S EXECUTION. We are also reaching out to news media to help spread the word. Please sign this petition, take the actions requested and share with everyone you know to SAVE KARMA. Learn more on our Facebook page! Take action and send the letter to the all the people listed. Karma, a husky has been wrongfully deemed to be executed today on September 11, 2015. Karma is a northern breed dog that thru many errors on the part of the owners and Orange County Animal Care is set to be executed for supposedly being a wolf dog. Wolf Dogs are NOT illegal in California. A DNA test performed (that is not an accredited test and is not typically one used in court) showed that she has very low wolf markers. In speaking with Cecilia Penedo from UC Davis , who is the Researcher and Director of the lab it was performed in today 9/11/2015, she stated that it is possible that a northern breed dog can show the markers of having wolf in it when it actually does not. If Karma is a wolf dog, this point is actually moot as Wolf Mountain Sanctuary has offered Karma a home. This is a fully accredited 501 c 3 non-profit rescue and Karma should be released to them rather than be executed for ignorant reasoning. There are many wolf dogs that live in Southern California and no special license is required unless the animal is a F1 – which is a descendant of a wolf and a dog, which clearly Karma is not. It is inhumane for Orange County Animal Care to kill a dog when a rescue has been offered and the rescue has agreed to take her. Wolf Mountain Sanctuary is authorized to have wolves and wolf dogs and Karma should immediately be released to them to free up a kennel for another dog. Animal rescues are able to adopt animals that have been designated as part of the shelter’s LIFE Program free of charge. Also, adoption fees are waived for dogs after 30 days. By law, these organizations can take animals that OCAC cannot allow to be adopted by a private citizen. The LIFE Program is based on the following criteria: significant physical and/or medical conditions, significant behavioral issues, length of stay, and amount of medical treatment and services provided by OCAC. We are reaching out to you to stop this killing of this innocent dog today and have Orange County Animal Care release her to Wolf Mountain Sanctuary, a non-profit rescue organization. Karma is a loved family dog and a registered service dog for her owner Josh Ogle. She is a part of a family and is missed deeply by all. Please note that this is an URGENT matter and take action immediately. Orange County Animal Care needs to be contacted to stop this tragic unnecessary death. Karma is en route to North Carolina, once she arrives we will let you know. We Won!! Karma is saved!! Thank you so much to everyone that helped it took a huge amount of people to do this and I appreciate everyone that helped we couldn't have done it without you!! Karma is still ALIVE!!! We have filed new papers at court, so please keep checking back and sharing this with everyone for more signatures. If you have media contacts or if you know anyone that has ADA - American Disabilities Act Service Dog knowledge, please have them contact us. Karma is a ADA Service Dog. It is so awesome to know that over 22,000 people care about Karma!!! The Ogle's, Wolf Mountain Sanctuary and all that love Karma appreciate you!! !